b. the local perspective of the dynamics of such transfer in time . Transfer is computed over samples from all variables – there is no training in or subset selection of variables to use. We apply this method to a set of fMRI measurements where we could expect to see differences in local information transfer between two conditions at specific time steps. The fMRI data set analyzed (from ) contains brain activity recorded from 7 localized regions while 12 subjects (who gave informed written consent) were asked to freely decide whether to push one of two buttons (with left or right index finger), whenever they felt the urge to do so, and to press the button immediately on deciding . To our knowledge, this is the first analysis of transfer entropy on a local temporal scale in brain-imaging data (at specific time points rather than via sliding windows). b. aggregating local TE differences across 2 to 3 consecutive time steps (e.g. t=2,4 and 6 sec. after button press). Additionally, thresholding of these TE differences can decode the button push with a (statistically significant) mean of 65% accuracy across subjects. These measurements of local TE correlate well with the role of these regions in executing the motor response here . We confirm that local TE can be used to reveal differences in task-based dynamical information transfer, with potential for the technique to be improved in the future. Difference in TE(pre-SMA → left motor) and TE(pre-SMA → right motor) versus time after button press for subject 1. Error bars are std. err. over presses. 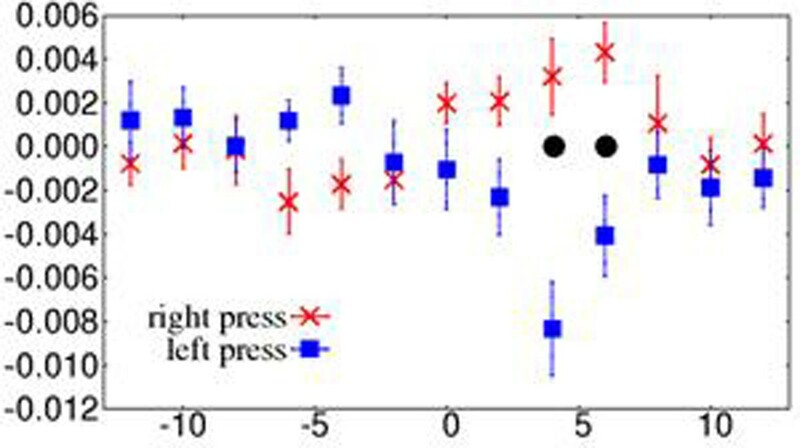 Significant difference between left and right button press indicated by · at t=4 and 6 sec (no aggregation over consecutive time steps).